I am by no means a great baker, I'm a novice really but I do enjoy getting in my kitchen with fun ingredients all around me whipping up a few festive things! I made 2 INCREDIBLY easy treats this past weekend. The pretzel creation I brought to work to share with my co-workers and the Oreo pops I took to a Christmas party for church. They were both such a hit...thank goodness! The little pretzel poppers (I think I just made up that name for them? haha!) are so easy to make and delicious! 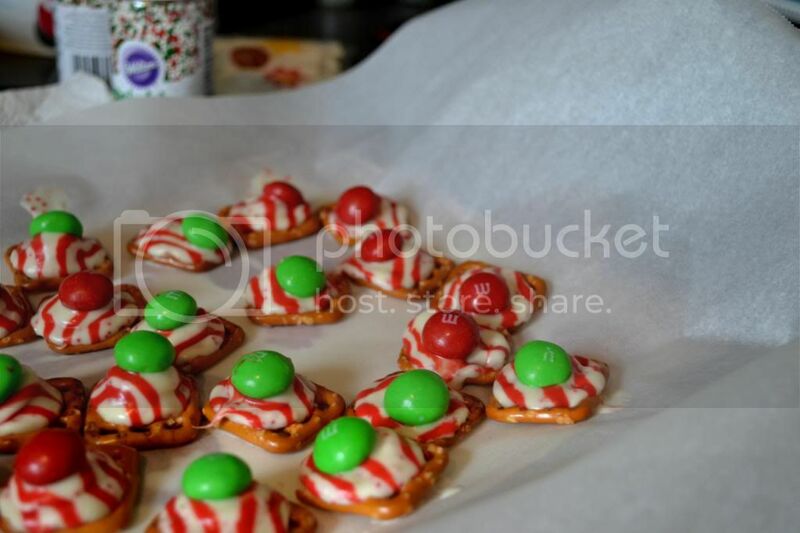 You just need mini square pretzel, Hershey kisses and M&Ms. 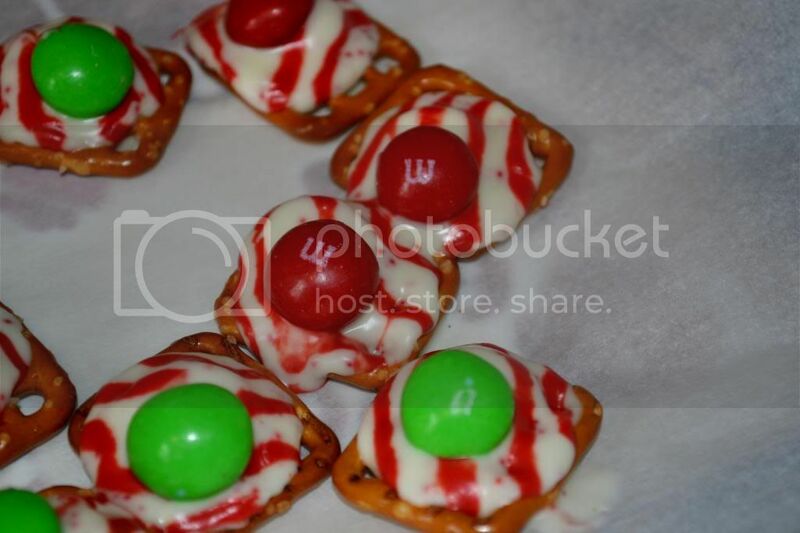 I used candy cane Hershey kisses and peanut butter M&Ms. Lay out parchment paper on your baking sheet, line it with pretzel and place one Hershey kiss in the middle of each. Your oven should be pre-heated on 200 degrees. Pop those little babies in the oven for 4-5 minutes. You don't want your chocolate to start oozing, just to be shiny, so you can tell its softened. Take them out then press one M&M in the center of each. Then place them in the fridge for about 5 minutes and voila, a very tasty and addictive treat! I packaged mine in cute little Christmas bags and put them in our office kitchen. Everyone raved over them and asked me how I made them! I'm going to make another batch to take to my moms on Christmas! 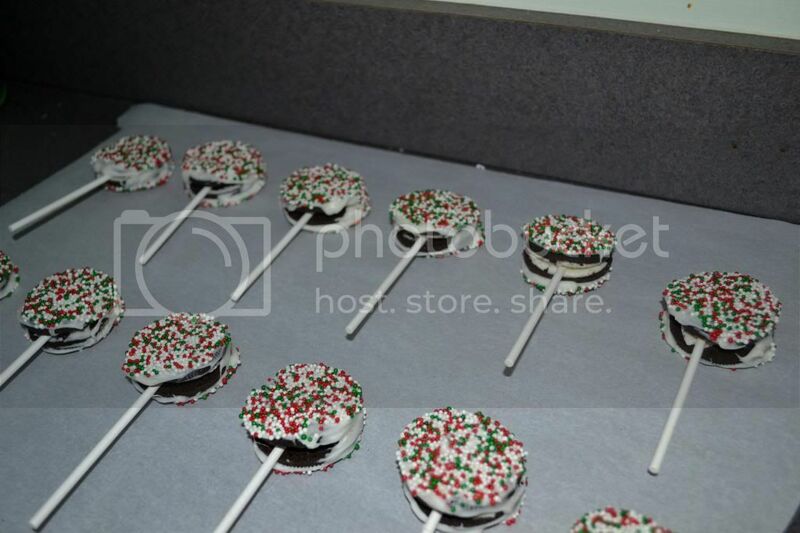 Next up were the Oreo pops. 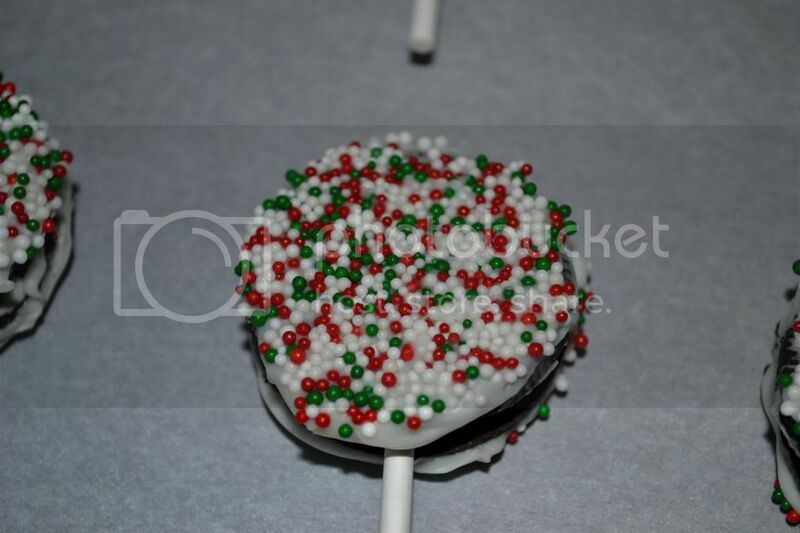 You'll need Oreos, festive sprinkles, sucker sticks (which you can find at WalMart in the craft section) and white chocolate. 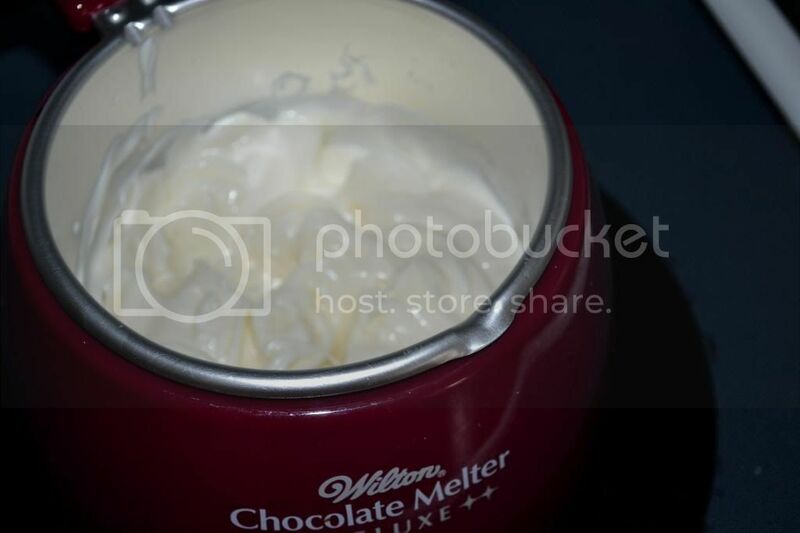 My mom has this little fondue pot so I used it to melt my chocolate but you could definitely get the same results using the microwave. Melt your chocolate and split your Oreos. 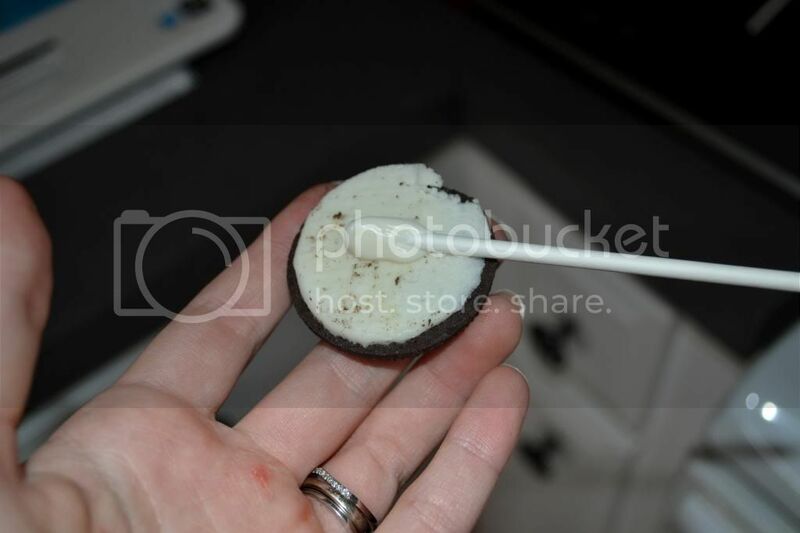 Put a little chocolate on a sucker stick then place it in the middle of the Oreo and put the Oreo back together. 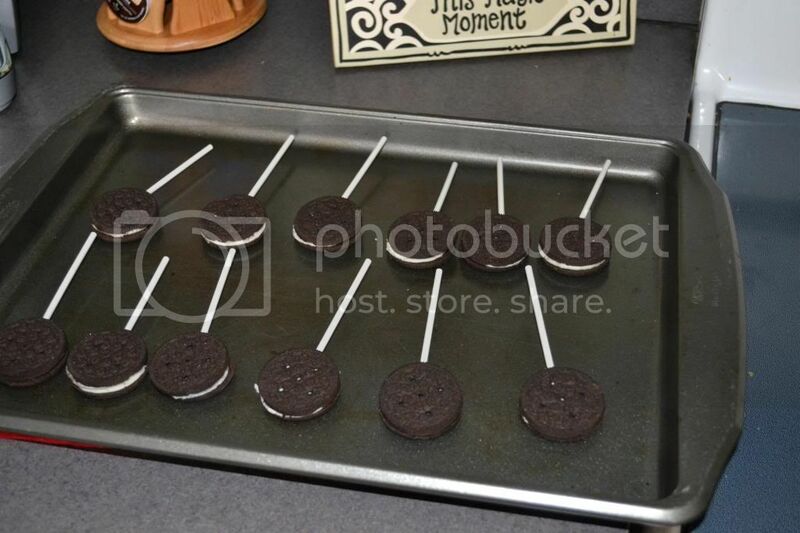 After you've done all of your Oreos let them sit for a few minutes to create a "bond" so that the stick will stay in place and hold the cookie together. Then coat your Oreo in the chocolate. I used a spoon to do this and thought it worked fine but if you had a bowl with a large opening you could probably just dip the whole thing in there. Have your sprinkles already dumped out into a plate then dip your cookie in the sprinkles, place on parchment paper and let sit for about 20 minutes and you've got one tasty treat on your hands. GREAT for parties and I can imagine that kids would loveeee these! I took these to our church Christmas party, and yet again, these were a hit! I'm trying my hand at mini cheesecakes for Christmas and homemade fudge, I'll be sure to report back on how those turn out, wish me luck! The last half of this week has been kind poopy...but it's Friday, praise!!! And it's my offices Christmas party today which means gooooooooood food, more praise!! Happy Weekend, friends!